As for offshore oil and gas platforms, life expectancy of more than 20 years for offshore wind turbine installations requires that corrosion protection plays an important role. Apart from the durability of the corrosion protection, maintenance should also be as little as possible during the planned operating period, since any type of repair offshore is very expensive. Cathodic protection is very effective in zones of structures that are permanently immersed in water but is largely ineffective in transition and splash zones because the metal is not continuously in contact with seawater (the electrolyte). Normally, the steel components here are protected with polyurethane or epoxy resin-based coating systems that have a life of roughly 15 years. One thing that these systems have in common is that they have to be repaired and partially renewed regularly to achieve their designed life time. The transition zone, in particular, causes considerable expense. Another method of corrosion protection was first tried out successfully in 1949 in the Gulf of Mexico and has since, been used for installations subject to particularly aggressive conditions in the oil and gas industries such as steel legs and hot risers. The method involves cladding the steel supports with alloys containing nickel and copper. In the first installations, alloys containing high levels of nickel were used, but, for economic reasons, improved copper-nickel alloys have also been used in more recent times. Copper-nickel 90/10 is known to be a seawater-resistant alloy that is used in many areas of the offshore industry. Its main properties – anti-fouling and resistance to seawater – are utilised mainly in seawater pipeline systems, to clad ships‘ hullsand to sheath the steel jackets of oil and gas platforms. One of the first large projects in which CuNi 90/10 was used as corrosion protection in tidal and splash zones was in 1984 on the columns of the platforms in the Morecambe Bay Gas Field, a large gas deposit in the Irish Sea. In this project all the accommodation, production and drilling platforms were sheathed in copper-nickel sheets. The height of the sheathed areas ranged from +13 to -2 m above and below the lowest water level. The metal sheets are 4 mm thick and were welded directly on to the steel, as the main purpose of the cladding in this case was corrosion protection and not so much anti-fouling. The underwater part of the columns was protected cathodically with zinc anodes fixed directly to the steel. Because of the extremely corrosive atmosphere structures are exposed to, the classification companies specify a corrosion allowance of 12 mm when steel and conventional coating systems are to be used. This allowance is not necessary with 90/10 coppernickel cladding, which meant that, in the case shown in photographs, it was possible to save almost 700 t steel. Together with the much lower maintenance costs of the corrosion protection compared to conventional systems, this variant was chosen as the least expensive. Regular inspections have found no indication of corrosion on the steel or on the 90/10 copper-nickel cladding. No repairs in the zone protected by the 90/10 copper-nickel were necessary, since mechanical damage to the corrosion protection, such as may occur in service which conventional coatings were prevented by the robust nature of the coppernickel plates. 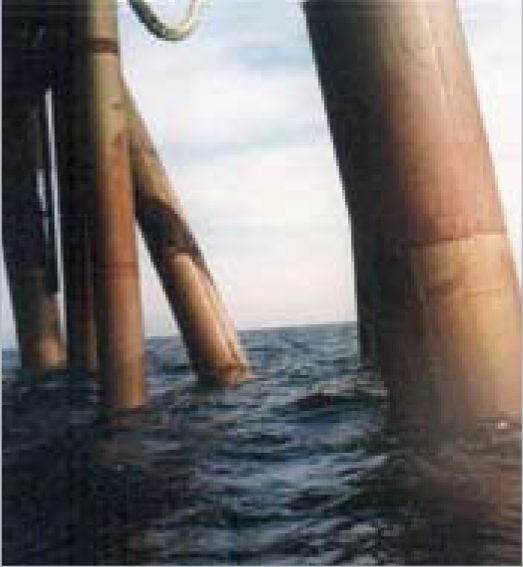 Thanks to the absence of the need for a corrosion coating on the steel columns in the transition and splash zones, and the lack of repairs or maintenance of any kind required in this area, the cladding of offshore load-bearing structures with 90/10 copper-nickel plate has been demonstrated to be a more durable and economic alternative than conventional protection methods. In this context, KME has designed and developed a new type of Boatlanding. A Boatlanding is a docking site for boats to transfer people from the boat to the wind farm. 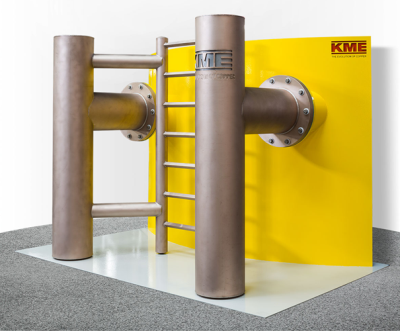 For the KME prototype, it is completely sheathed withcopper-nickel 90/10 to provide a protective cloak around vulnerable areas (e.g. tidal zone and splash zones) as a defence against humidity, high salinity and, in particular, growth of marine fouling. There is also a further benefit as in spite of protective rubber coatings around ship hulls, to protect them when mooring alongside, coatings on the Boatlanding can still be damaged. Compared to coating systems, copper-nickel easily absorbs such docking manoeuvres. Furthermore, a smooth transfer from the ship to the Boatlanding may be threatened if the Boatlanding is completely covered with mussels and this can be significantly reduced by copper-nickel.